CSITEd, Computer Science and IT in Education, is a nonprofit organisation whose goal is to promote computer science at large, both in terms of technology and as a science. It focuses its activities mainly on primary and secondary school pupils as part of their education, but also on teachers and the general public. 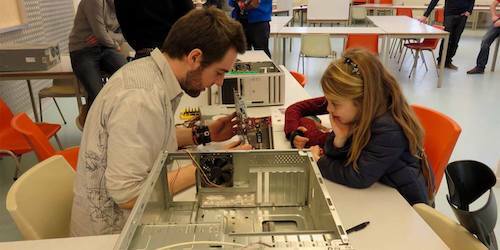 A girl is discovering the internal parts of a computer and got the opportunity to assemble one during the Computer Science Day 2015. 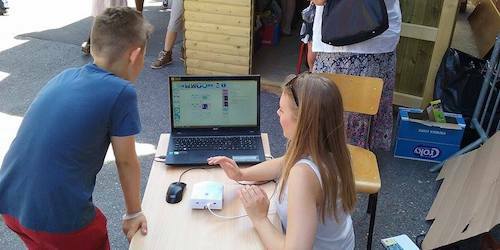 Children are discovering the Thymio robot and got the opportunity to learn how to program it and then to directly test it during a school fair. The Belgian representative to the Bebras community is attending the annual International Task Workshop 2012 to create new questions for the Bebras contest. A unique, stimulating and fun competition, inspired by the Bebras contest, open to IT students and IT professionals. What better way than to become the Belgian champion of problem solving, behind which an IT concept is hiding every time? A day of discovery of computer science in all its shapes, open to pupils and teachers and their families. A unique IT Escape Game, questions from the Bebras contest, but also demonstrations and a conference.